A team of Belgian and Turkish researchers has seen robots learn to efficiently divide up their tasks when allowed to "evolve" behaviours along Darwinian principles. Some insects like honeybees, termites and ants have long exhibited "eusociality" - a quality that allows them to specialise into different roles in their colony. 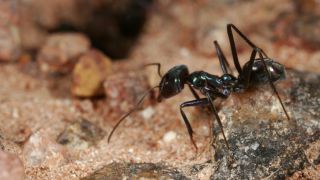 In ants, for example, queens and a small number of males are the only reproducers, while soldiers and workers create the best environment for them to reproduce in. Now robots are doing it too. Eliseo Ferrante and colleagues used artificial evolution and detailed robotics simulations to design controllers that allow bots to effectively organise themselves. "Remarkably, division of labor was achieved merely by selecting on overall group performance, and without providing any prior information on how the global object retrieval task was best divided into smaller subtasks," they wrote in a paper in the journal Computational Biology. It's hoped that the technique could be used to develop intelligent swarms of robots that can organise themselves to solve unexpected tasks on other planets.